United Airlines pilot flushed bullets in toilet: Derp. 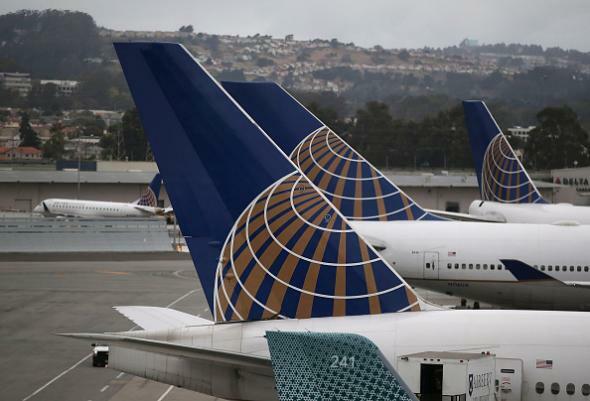 United Airlines planes at San Francisco International Airport during Wednesday’s computer crash. It hasn’t been a great stretch for United Airlines. Its computer system crashed Wednesday morning, requiring a nationwide halt in takeoffs—the second time in six weeks the company has had to take that drastic step. FiveThirtyEight, meanwhile, found in June that United was on average the most delayed major airline. Also, one of United’s pilots just got in trouble for putting bullets in a toilet. The captain of a flight from Houston to Munich realized after taking off on June 23 that he had 10 bullets in his possession, which he was allowed to have under United States regulations but not under German regulations. The captain threw the bullets away in a wastebasket. A female passenger lost a ring and a flight attendant searching the wastebasket for the ring found the bullets (!). The flight attendant gave the bullets to the captain, who then flushed them down the toilet. After being asked about the situation by the flight attendant, the captain ‘fessed up and notified ground authorities about what had happened. The plane was searched on the ground, and the bullets were recovered. The TSA and United are investigating the incident, but the pilot hasn’t been fired and is not expected to face criminal charges. He was, however, responsible for delaying his plane’s return flight to the United States by four goddang hours.